I often buy Weetabix for my children. However, I generally stick with the plain varieties and NOT the chocolate ones. I can’t contemplate giving them chocolate for breakfast. 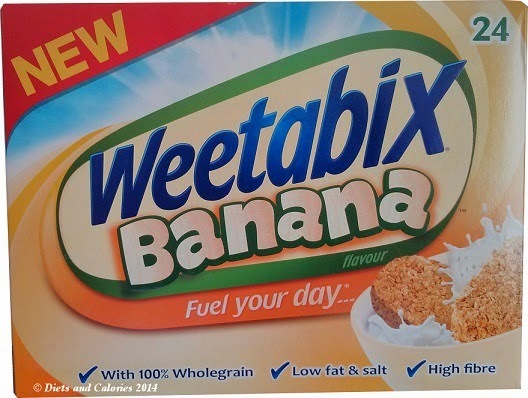 But, I did deviate this week from my usual purchase when I saw a new variety called ‘Weetabix Banana’. This was one of those spur of the moment purchases, so it wasn't until I unpacked them that I got around to reading the nutritional details. Fat, saturates and salt are all low which is great. Sugar just scrapes into the medium category with 15g per 100g of cereal. 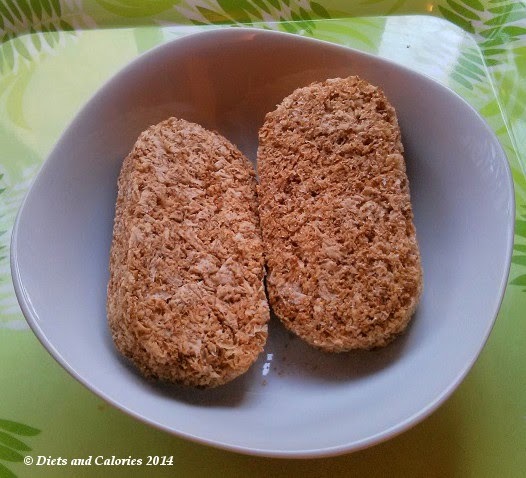 This works out at around 1.5 teaspoons of sugar per two Weetabix, so not too bad. Looking at the ingredients, there aren’t any actual banana pieces, but they are called 'banana flavour' which means they could be flavoured with anything that tastes like banana. In this case the ingredients just mention 'flavourings'. Opening up the pack and having a quick sniff, I could faintly detect a hint of banana. I was pleased about this as there’s nothing worse than an overpowering smell of chemical flavourings! My daughter has one and a half Weetabix for breakfast and I found them quite tough to break. This was good really as it meant there weren't loads of crumbly bits falling off. After heating up some milk and serving them up, I had a small taste. Mmm, these are really quite nice. Just a subtle hint of banana but still retaining their essential wheaty texture and flavour. Now the taste test by my daughter. She didn’t know I’d bought these, so I served them up and let her dig in without telling her what they were. I noted her puzzled expression after the first mouthful then caught her tentatively sniffing at the bowl. She did however, carry on eating and sniffing, so must have liked them. I asked her what she thought. She said ‘nice’ and that they tasted fruity. I asked her what fruit they tasted of. And unfortunately, she said she didn’t know. She does know what bananas taste like as she eats one most days. This did make me wonder whether I was influenced by the fact that I knew they were banana flavoured, so that’s what I tasted! It’s a bit like when you ask someone to close their eyes and you feed them a crisp and ask them what flavour it is. It can be incredibly difficult to work it out. The mind is a complex thing! Overall, I liked them, my daughter liked them, so I’d be happy to get them again. Purchased in a branch of Sainsbury’s. Nutrition per 44g serving (2 biscuits) without milk: 157 calories, 4.4g protein, 31g carbs, 6.6g sugars, 0.9g fat, 0.2g saturates, 4.3g fibre, 0.1g salt. Nutrition per 100g: 357 calories, 10g protein, 70g carbs, 15g sugars, 2.0g fat, 0.4g saturates, 9.7g fibre, 0.23g salt. Ingredients: Wholegrain wheat (92%), sugar, malted barley extract, flavourings, salt, niacin, Iron, Thiamin (B1), Riboflavin (B2), Folic Acid. I bought these by accident as the package is so similar, in fact quite different to the picture above. 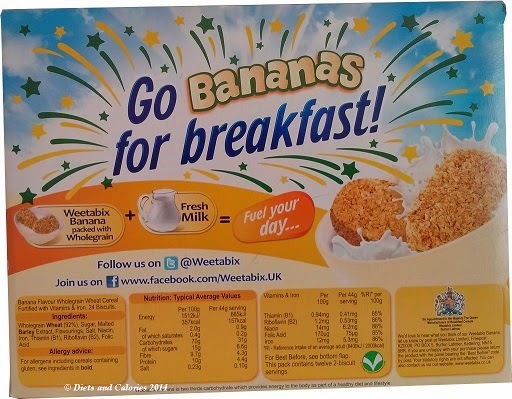 I thought I would give Weetabix the benefit of the doubt, I quite liked their Oatibix. I can understand why your daughter did not recognise the flavour, as it really was nothing like real banana. I did recognise banana flavouring, which I've not had for years, and never wanted to taste again. I found this product truly disgusting.